Today I invite you to the second part of the review of Japanese street food. It could probably be part third and fourth, because what I present you is just a small part of what Japan offers in the subject of quick and tasty snacks. Probably you will not find such a varied selection of street food anywhere in the world. In addition to the fact that in Japan you can find dishes from around the world, they primarily have hundreds of their own street food recipes. First, we will go to the Nishiki Market in Kyoto, which offers us even more variety and more original street food than the markets in Tokyo. Prepare something to eat and I invite you to read! Nishiki market is just a long, covered shopping street. On both sides there are shops that sell seafood in various forms, vegetables, pickles and various snacks. Inhabitants of Kyoto still do shopping there, although it can be said that tourists tend to prevail here. Some stores are family businesses run by successive generations, which are a well-known brand in all of Kyoto and even Japan. Big competition means that sellers are always coming up with new ways to attract customers. Surely, the person who invented the octopus that you can see on the picture below, knows how to do that. Octopuses are cooked in a thick, slightly sweet sauce that creates a shiny glaze on the surface. They look almost like lollipops or candied fruit. However, because of these wrapped octopus legs you can not mistake octopuses with sweets. The meat is fragile and there is a surprise in the head – a boiled quail egg. Nishiki Market has been called “Kyoto kitchen” for several centuries. It’s crowded and narrow place. There are 100 stores and restaurants there, so there is plenty food to choose from. Most of the shops specialize in a specific type of food and usually they sell local products. Katsuobushi is fermented, smoked and dried skipjack tuna. It is used to prepare dashi, which is the basis of many Japanese dishes. Katsuobushi is hard like a stone, which is why you need a special tool on which you can grate katsuobushi. It is always used in this form, not only to prepare dashi, but also to sprinkle with it takoyaki or okonomiyaki. At every Japanese market, seafood will be prevail. This is the basis of the Japanese diet. Fortunately, you do not have to buy seafood raw and cook it by yourself. Who used to cook octopus knows that for the next few weeks, her spirit is still floating in the apartment 😉 Just go for example at Nishiki Market where you are able to try various types of seafood in different form. It can be raw, fried or grilled, just like the squid in the picture below. Hamo is a sea eel, which is a luxury ingredient and announcements of the upcoming summer in Kyoto. This characterful fish has hundreds of tiny bones that people cannot remove. The Japanese have developed a special hamo cutting technique using a knife that is only used for this task. A series of cuts is made that cross the bones but do not disturb the skin of the fish. Hamo is cut into size-bite pieces and then cooked. Thanks to this you can eat hamo with its bones. At Nishiki Market you will buy Hamo much cheaper and also in the form of sushi. Another shop specializes in kinako. This is flour made from roasted soy which is used in traditional japanese desserts. One of them is kinako mochi, here in the version on a stick. When I bought kinako mochi I did not know what it is yet, I chose what caught my eye. And that was a good choice. It is one of those things that taste I remember to this day. Still warm, recently made mochi and kinako, which gives it a slightly nutty and roasted aroma. It’s very simple street food, but it makes you warm and cosy. The last street food that I want to tell you about are donuts. The best donuts I’ve had in my life. They’re called Tonyu and they’re made of soy milk. Various sprinkles are available, but they taste best in the original version. Freshly made, still warm and delicious! We leave Nishiki Marekt and go to snacks that can be eaten throughout Japan. Nikuman is a Japanese version of Chinese baozi buns. This delicate and light bun has different fillings and is steamed. When you buy nikuman in Japan, you can be sure that it has a lot of filling and although it looks light, it weighs a lot and will satisfy your hunger. Usually in the middle you will find a filling of pork but pizza-man bun is also very popular. As you probably guessed, it’s a filling with a sauce for pizza, spices and cheese. The addition to the buns is often Japanese mustard. Nikuman is the favorite snack on colder days, which warms you up and tastes great. Kare Pan or curry bread is a deep fried delicacy filled with Japanese curry. A panko is sprinkled on top, which becomes crispy after frying. The aromatic filling consists of several dozens of spices, potatoes, onions, various kinds of meat and carrots. These are the standard ingredients in curry but of course other versions of kare pan are also created. Vegetarian versions, with additional vegetables, cheese or soft-boiled egg. Kare Pan is best warm, you can buy it from street vendors specializing in this street food, but you will also find it in every Japanese bakery. Usually, they offer a reheating option and I suggest you to use it. Kare Pan is not only a quick snack, it can also be a meal that will fill your hungry belly. If so far you associated Japanese cuisine with healthy food, I must tell you that this is not always true. The Japanese people love breaded and deep fried food. Here’s another one – Chicken Karaage. Typically, these are the fatter parts of the chicken. Karaage in this form is the most popular, although it can also be fish or other seafood. The right temperature and frying technique keeps the chicken juicy. In addition, it is marinated in soy sauce, sake, mirin, garlic or other spices. Thanks to this it tastes really great. You can easily make a chicken karaage yourself. Choose your favorite parts of chicken, marinate in your favorite ingredients (it can be just soy sauce and garlic), then coat in potato starch. Then deep fry it and it is done! And now it’s time for dessert. 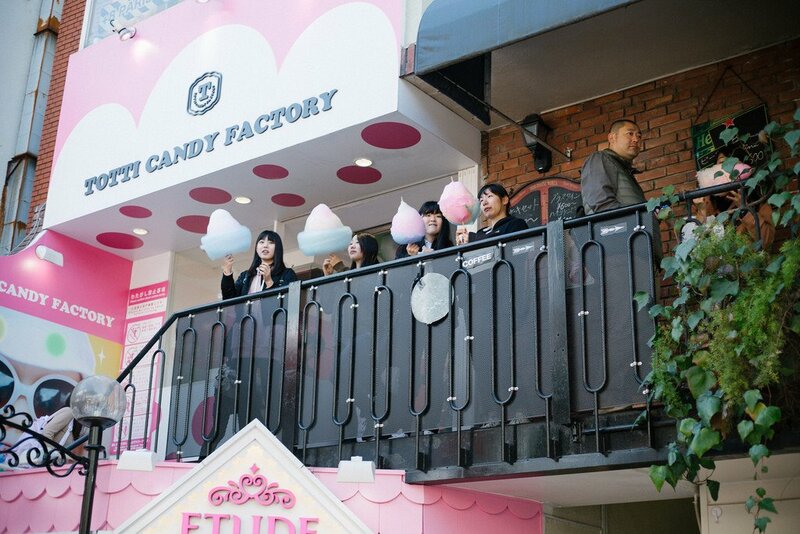 In Harajuku, a fashion district, you can find mainly sweets. Those sweets that look beautiful and the best on Instagram photos. Japanese and foreign people come to Takeshita Street to snap a photo with colorful and beautiful-looking sweets. The best known and liked for years are pancakes with various toppings. Usually there are dozens of different versions to choose from. With ice cream, whipped cream, fresh fruit, various sprinkles and toppings. A thin pancake and a lot of filling. Nobody can resist the Japanese pancake. Fake pancakes tempt us from the exhibition and make it difficult to decide which one to choose. Of course, you can choose a few pancakes but there is still a lot to eat. I wonder how the ladies from the service remember all these configurations? Croquant Chou Zaku Zaku is a puff pastry sprinkled with a crunchy sprinkle of sugar, butter and nuts. They are freshly baked on site and filled with vanilla custard. Zaku Zaku is also baked in the form of a cone for ice cream, so it’s best to try two versions 😉 Crispy cake and delicate cream create a brilliant and very sweet composition that disappears at a second. So excuse me that I don’t have more detailed photos. Zaku Zaku has been eaten before I pulled out camera from my bag. 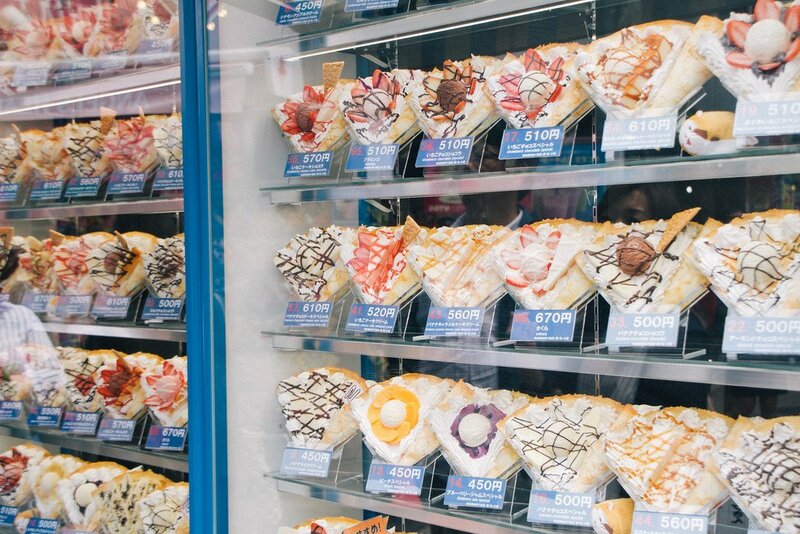 These are just some examples of popular sweets from Harajuku. You can also buy ice cream there, which does not melt even in full sun. They are certainly very ‘natural’ but you can decorate it yourself. If you are not a fan of chemical flavors, then you are more likely to choose ice cream made from Hokkaido milk. This is the largest milk producer in Japan which is said to be the best in the world and so will the ice cream made from this milk. While we are at a sweet street food, kakigori must appear. It is the perfect dessert for hot days. The ice is wiped with a special machine and creates a fluffy cloud. It is coated with syrups or condensed milk. You can also add fresh fruit or adzuki paste. The version from the photo is sprinkled with kinako, a flour made of roasted soy and in the inside, my ‘favorite’ adzuki paste is hiding. Kakigori quickly melts, especially when we eat them on a sunny day. However, it does not turn into ice crystals, which may hurt your palate. All because of the secret way of preparing kakigori. Daifuku is a variety of mochi which is sold basically everywhere. The delicate rice flour cake traditionally contains a filling with matcha cream or a red bean paste. In the middle of daifuku you can also find fruits, vanilla or fruit cream and whatever you want. This is the end. What else can I say? I think the pictures speak for themselves. In Japan you can find delicious and diverse street food and everyone, I assure you, everyone will find something to eat. It is a pity that Japanese street food does not appear anywhere in the world. Well, we can only try to recreate these flavors ourselves. Is it successful? Not always. But I don’t give up!